Avon Campaign 21 is officially here and boy are there some awesome deals going on! First, there is the Anew Clean Cleansing Brush. Normally, this brush costs $40; however it is currently on sale for $24.99! Avon states this brush is comparable to Clarisonic’s Mia 1 Sonic Cleansing Brush. As of 9/16/16, Clarisonic’s online store states the cost of their brush is $129! We’re looking at $100+ difference and it looks as though we’re not sacrificing quality as Avon’s Anew Clean Cleansing Brush currently holds 5/5 stars! How impressive! 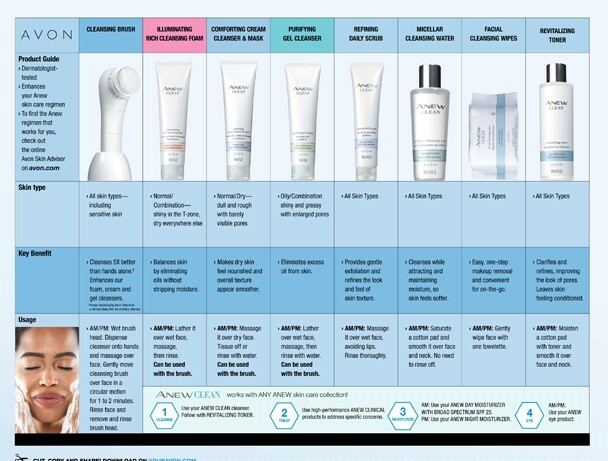 To get your new Anew Clean Cleansing brush, click here. For more details, read below. Description: Introducing our vibrating cleansing brush. Ultra-soft bristles gently yet effectively remove impurities and leave your skin feeling thoroughly cleansed and delightfully pampered. • Twice daily, dampen facial skin and brush head with water. Dispense your cleanser onto hands and massage onto face. Turn cleansing brush on and gently move it around your face in a circular motion for approximately 1-2 minutes. Avoid eye area. Rinse face with water. Remove and rinse the brush head then reattach it to the unit to dry. • Can be used with the Anew Clean Illuminating Rich Cleansing Foam, Comforting Cream Cleanser & Mask, and Purifying Gel Cleanser. For a personalized free online consultation, click here to be directed to our Skin Advisor. All Avon products available online at www.chicagosbeauty.com.